MasterCard and Zwipe are making a contactless payment card with a fingerprint sensor. The credit card that really knows you. Apple Pay and other mobile payment services are trying to change the credit card system we currently rely on. Instead of carrying hunks of plastic in our wallets, everything could be centralized and secured on our smartphones—perhaps using a fingerprint sensor as one layer of protection. It sounds like a cool future, but it’s going take a while to get there. In the meantime, MasterCard has a plan for an incremental step. Working with fingerprint technology company Zwipe, MasterCard is rolling out a payment card with a fingerprint reader built in. The card doesn’t have a magnetic strip, though. It uses an EMV secure chip popular in European credit cards (and slowly gaining traction in the United States) to allow contactless payment by tapping the card against a terminal, or payment by inserting the card into a chip reader. Here’s the crucial component: For either payment method to work, you have to have your thumb covering the fingerprint sensor to verify your identity against the biometric data stored on the card. Instead of signing something or entering a pin, the card tells the terminal that you are the same person who holds the account and that the transaction can go through. 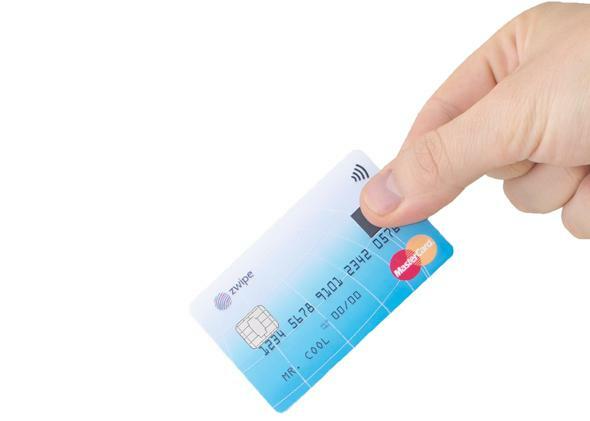 MasterCard and Zwipe did a pilot of the fingerprint card in Norway, and now they’re moving ahead with refining the card prototype used there and getting the system ready for release in 2015. In the prototypes the card had an onboard battery, but in the final version the card will be powered by wireless charging from the terminal to do the fingerprint read and data transmission. Fingerprint sensors are becoming more ubiquitous on electronic devices, but having one on your credit card seems like an easy way to add extra security to what is clearly an insecure system.